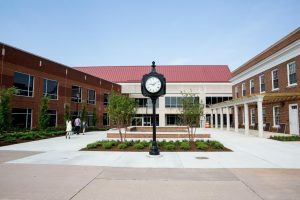 Longwood University Brock Hall: LEED Silver - E.K. Fox & Associates, Ltd. The USGBC announced that Brock Hall (Longwood University Student Success Center) achieved LEED Silver certification on November 28, 2018. This new building is a centralized hub for essential academic support services and an important resource for current and future Longwood students. E. K. Fox & Associates, Ltd. contributed to the LEED design efforts through the design of energy efficient mechanical systems utilizing on-site renewable fuel sources, water use reduction fixtures, LED sourced lighting and occupancy based lighting control systems all contributing to maximum energy reduction.